A waterproof membrane set on the outside of basement walls and subsequently protected by an outside skin, often of brickwork. Usually of asphalt, butyl rubber or bitumen/polythene sheet suitably jointed. Tanking to the basement floor is laid under loading coat which is provided to prevent tanking from being displaced by water pressure beneath it. An automatic valve fitted to individual radiators. Provided to maintain desired temperature in each room rather than from a centralised thermostat. Compare Room thermostat. Consists of a tie plate and tie rod. The tie rod is passed through the external wall and anchored between the tie plate and floor joists. Provided to restrain distortion or untied flank walls from further movement. Tie bar forms are usually circular, S or X shaped or CPlll stainless steel restraint straps. Their provision, design and spacing should be calculated by a structural Engineer or charted building surveyor. The provision of tie bars does not necessarily render a property unstable or unmortgageable but they may deter some prospective purchasers and therefore restrict marketability and therefore could adversely affect the value of the property. Comprises load bearing preformed timber framed walls erected on a prepared ground slab. The walls are bolted together and clad externally with a non-load bearing external skin of brickwork or alternative type of cladding as weatherproofing. A horizontal member which separates the lights of a window. Not to be confused with glazing bars which divide lights into panes and can be vertical or horizontal. Compare Mullion. Root of a tree. Roots can disrupt foundations and drainage by dewatering the subsoil. In the worst cases foundations can be undermined and require underpinning. With regard to drains, roots can cause drains to fracture and leak which can also disrupt foundations. Also, roots can enter the drain pipe via a small crack but once inside increase their diameter substantially, eventually growing and spreading in size to complete block the drain pipe. Willows, Poplars and Oaks are the most dangerous trees and should be located more than 25m from a building with vulnerable foundations. Remains above ground of cut down tree. When a tree is removed because it is liable to cause damage to a property with vulnerable foundations consideration must be given to the risk of heave occurring once tree has been removed. If the tree to be removed is still healthy it may be prudent to remove it over, say three years by removing half the height in the first year and bringing the tree to ground level in the second and third year. If the tree is in its declining years it may be possible to remove it in one go. However, it is recommended that the advice of a tree surgeon is sought when removing trees from close to a building or drains. Chimney breast left hanging when lower portion removed. Many chimney breasts have been removed in properties since the 1960’s and 70’s when open fires were unfashionable. In some instances no support at all was provided to support the remaining upper portion of the stack. In other instances bracketed support has been provided but in many instances this is inadequate. In such circumstances the overturning forces of the eccentric stack weight cause the wall and stack to slowly lean over. A structural engineer or chartered building surveyor should advise on and design an adequate means of support. The part of lead roofing turned up against a vertical surface.Provided to weatherproof a joint between a roof and a vertical surface and is then covered by an apron (See Apron). The edge of a pitched roof at a gable. Usually pointed. 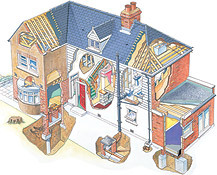 If pointing becomes defective or falls out this can allow rainwater penetration into roof structure timbers which can lead to fungal decay of the roof timbers. A horizontal timber bedded in mortar on top of wall. Provided to support ceiling joists, rafters, floor joists etc. The level of ground water on a site. The water table can vary seasonally or due to heavy rainfall or long dry spells. A dry basement floor can be dry when water table is low but be under water when it rises. A moulding fixed to the bottom of an external door. Provided to throw the water which has run down the face of the door clear of the threshold. A wood destroying fungus (Coniophora Puteana). Attacks wood and flourishes in wet conditions. Consists of a knobbly fruiting body with thread like strands. Wet rot can cause 40% weight loss (of affected timber) in four months and consequently significantly reduce strength of timber. Dies when timber moisture content falls below 43%. Therefore essential to cut off source of moisture and allow timber to dry out. The internal reveal to the soffit of a window opening. Usually plaster for decoration. A round-topped piece of wood. Provided to form the longitudinal junction between sheets of metal in flexible metal roofing (shown as lead on drawing). The wood roll is fixed to the decking and the sheets of metal are dressed over it, lapped and folded into a welt. Insect infestation of timber Various types of beetle (eg common furniture, death watch, long horn, powder post, weavil). These can affect structural integrity of timber. Death watch and powder post beetle indicative of damp or fungal decay.